Articular cartilage is an elastic, smooth, soft tissue which allows bones to interact with each other without friction or pain. Articular cartilage acts as a shock absorber for force applied to the joint during movement. 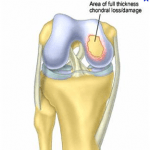 A chondral defect refers to damage to the articular cartilage located at the end of bones. Specific to the knee joint, damage can occur at the distal end of the femur (thigh bone), the proximal tibia (lower leg bone), or the posterior aspect of the patella (knee cap). Damage to articular cartilage may occur gradually as individuals age or acutely as the result of trauma to the joint. Once a cartilage defect is present, subsequent bone-on-bone contact may occur, causing pain and further tearing. Knee arthroscopy can be done to remove painful cartilage flaps. Microfracture is an additional arthroscopic procedure performed to restore injured cartilage. The procedure involves making multiple perforations into the subchondral bone in the areas where cartilage is deficient, which allow stem cells to fill the void out of the cartilage defect. Research shows these stem cells can form new cartilage in the area of the defect. This procedure has been performed on many professional athletes, such as Kobe Bryant, who underwent microfracture of the knee. 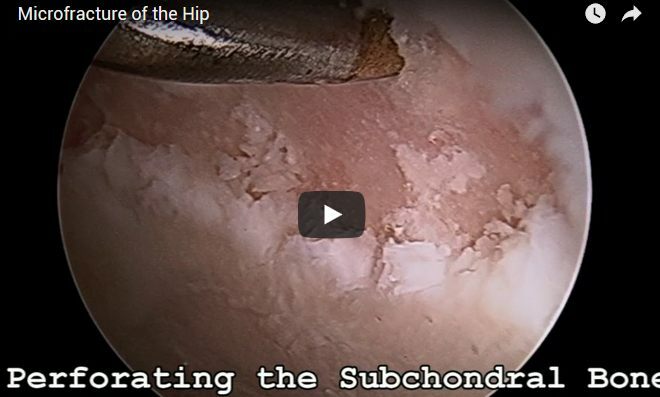 New developments have allowed arthroscopic microfracture to be successfully performed in the knee. Once undergoing a microfracture, a patient can expect to be on crutches for 8 weeks. This period of non-weight bearing allows for stem cells to stimulate undisturbed cartilage regrowth.